I love being able to look out my window to see the butterflies and hummingbirds. Usually I run outside with my iPhone and try to take their picture, sometimes succeeding, sometimes being so excited they flutter away. Two days ago I was on the phone with a client in Philadelphia who is having a very challenging time. As I was listening, I looked out the window of my office and saw a hummingbird availing himself of the red blossoming bee balm in my front garden. The other day I was talking with Gabe Horrisberger, my client. Gabe pointed out to me that many people spray their garden with chemical to kill the mosquitos, only to wonder why they don’t have any butterflies. My garden is full of not only butterflies and hummingbirds but also bees. Thank God for bees! I feel so privileged now every time I see one hovering over my flowers. Just recently I helped a client who had a severe skin rash. Her problem went away completely after she stopped eating the homegrown tomatoes from her family garden. Her cousin had been spraying chemicals all over the garden without recognizing how badly that one simple act was affecting the health of everybody else. If it’s not good for the butterflies, it’s not good for you. In February, I gave a talk at my Primrose Garden Club about common chemicals used in our gardens that are known to cause breast cancer. The Monsanto chemical Roundup is known to cause breast cancer. 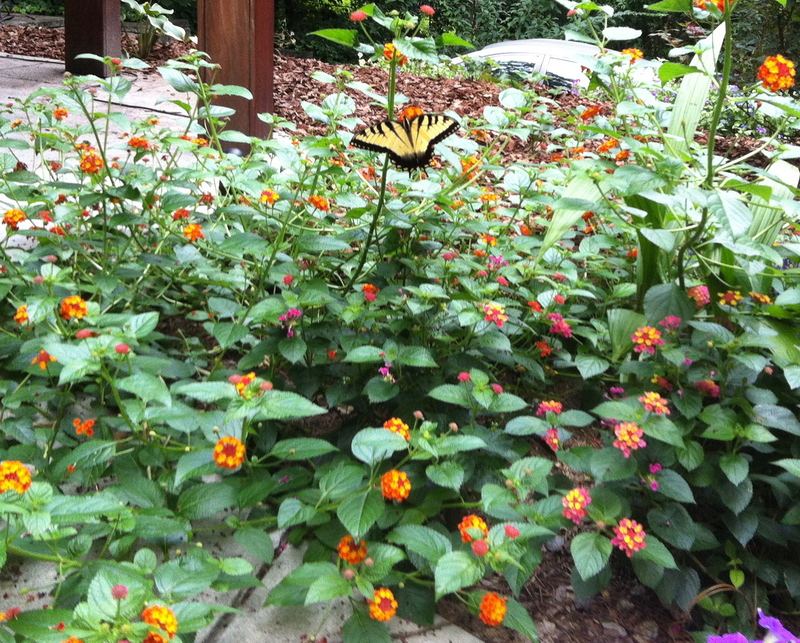 In addition to cancer, garden chemicals disrupt our neuroendocrine system. In my first book, Healing Depression: A Holistic Guide (New York: Marlowe and Co., 1997), I had an entire chapter devoted to the subject of chemicals and how our nervous system may become disrupted by environmental exposures we don’t even think about. Cornell University offers this very useful information about chemicals and the increased incidence of breast cancer at the following link. I am proud that my garden is 100 percent organic. Not only do I get to eat vegetables and fruits that are healthy for me, I am providing a safe haven for all God’s precious creatures. What is healing? Healing happens when we recognize how our actions affect the lives of others.